L'Encantada Domaine Lous Pibous 1999 18yo Single Cask #145 (54.7%): Now this is a 18 years old single cask Armangac to be thrilled about... 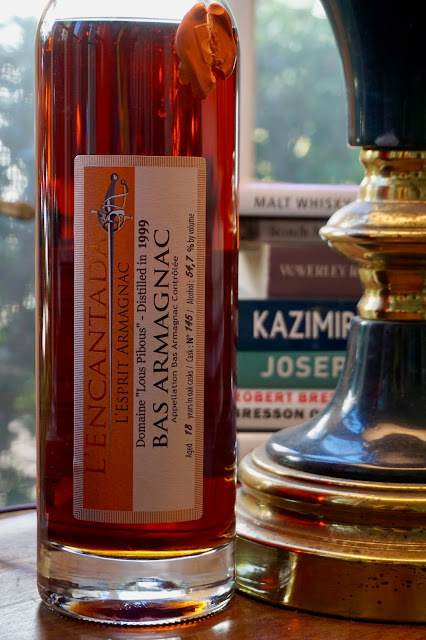 It is distilled at the legendary estate Domaine Lous Pibous 100% from Folle Blanche grapes and bottled by L'Encantada exclusively for K&L Wine Merchants without any filtration and any added preservatives. The cask carrying the number #145 is filled in 1999 and bottled in 2017 at cask strength yielding 342 bottles in total. Color: Dark amber with a red hue, varnished mahogany with very thin but slow moving legs around the glass. Palate: Grape molasses, aged grappa and black gardening soil. Incredibly easy to drink at cask strength... Tannic and tart. Dry cider and young Calvados. Tree bark, resin, black cherry soda and whole cloves. Adding water thins out the texture a little and makes it almost syrupy sweet: PX sherry, sticky toffee pudding and old school Rock and Rye. Finish: Long and sweet... Spiced rum, medlar fruit and cloves. Rock candy and toffee.